The Social Security Administration, including Administrative Law Judges and the Appeals Council, had denied all three cases for years but the federal district court decided that Social Security must conduct a new hearing on all three cases. All the clients filed their initial Social Security claims six to eight years ago and have been waiting for disability payments since. Third-year students Angie Barnett, Gil Greber, Rachael Kratz, and J.D. ’18 graduates Kathryn Della Ferra and Christopher Azijian wrote and filed the complaints, motion for summary judgment, and replies in the cases. “After working with my client for close to two years, I am incredibly happy she was finally able to obtain a just review of her claim," says Azijian, who is now working at Isicoff Ragatz, PLLC. “The Social Security Administration completely ignored their own regulations when they repeatedly denied these cases,” said clinic Associate Director Melissa Swain. The Health Rights Clinic has already won over $4,500 in attorney’s fees in one of the cases through the Equal Access to Justice Act and will file EAJA motions in the others. The clinic has five more Social Security cases pending decision in federal court, as well as a current caseload of over 100 cases in social security, health insurance, public benefits, and immigration matters. The Health Rights Clinic is prepared to reargue these cases in front of administrative law judges in Miami and secure much-needed disability benefits for its clients. “When I look back at my experience working on the case, I realize that it was the beginning of my legal career," said Della Ferra. 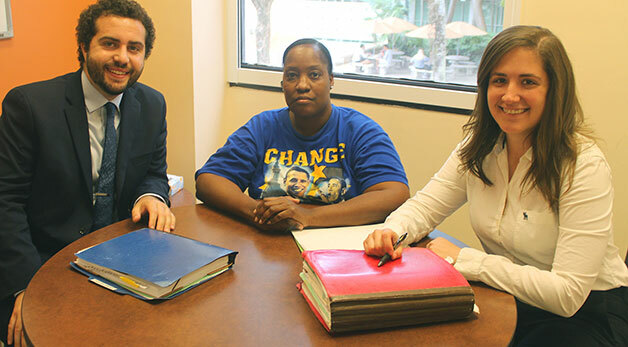 "For the first time since I entered law school, I was working for more than a grade in a class, or recognition from a professor—I was working for something that I believed in: fighting to secure the disability benefits that my client deserved. “With guidance from my directors, Melissa and JoNel, I felt empowered as an advocate to tackle the complicated legal issues that unfolded. The passion that drove my work with is the same force that drives me through the challenges I face today as an assistant state attorney in Miami. I am thrilled with the results we achieved, and I am eternally grateful for the experience,” she said.